Affordable and quality refinishing gives impossible-to-clean bathtubs, ugly tile and outdated kitchen countertops that Designed to Sell look! Professional surface refinishing by Miracle Method is a proven process that will save your client time, money, hassle and the mess of replacement. 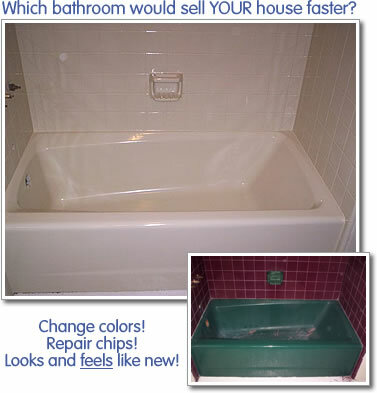 Deal killers like ugly avocado green, harvest gold, or pink tubs and tile will all disappear! Dated, stained and chipped countertops can be made to look like stone. "I use Miracle Method about ten to twelve times a year. Their process earns the seller top dollar for their home." Most Miracle Method makeovers can be completed in as little as 24 hours at a fraction of the cost of removal and replacement. Your clients will love not having to spend thousands to remove and replace a dated or damaged bathtub. Miracle Method can change the color, repair chips and fiberglass cracks and restore the surface to look and feel like new. Bathtub refinishing will not only save money, but also avoid days or even weeks of demolition that goes with replacement … and you’ll have a better looking property that will sell faster! What bathtub surfaces can Miracle Method refinish? Miracle Method’s process works equally well on porcelain, cultured marble, acrylic and fiberglass. Our proprietary non-acid bonding agent, MM-4, assures you, your client, and your buyer a long-lasting new finish that will not peel. It's guaranteed! When refinished by Miracle Method, the bathtub’s life will be extended for 10 - 15 years or more using the same basic care and maintenance guidelines as recommended by new tub manufacturers. Kohler, American Standard, Lasco and others do not recommend harsh or abrasive cleaners; neither do we! No matter if the vanity is Formica , Corian , tile or cultured marble, Miracle Method can makeover the surface to give it the WOW factor buyers look for in a contemporary bathroom. 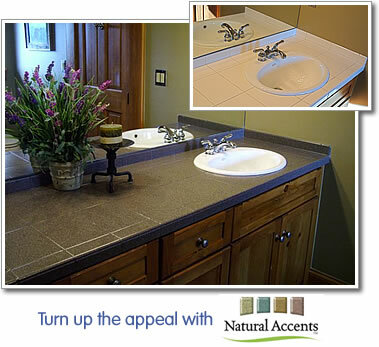 Our Natural Accents stone look is the perfect solution to provide color and excitement for these surfaces. 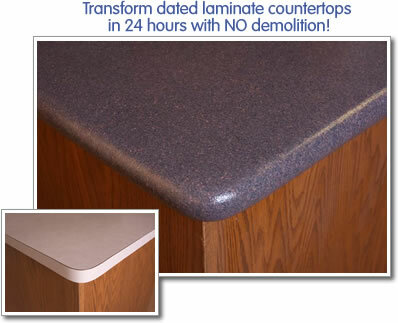 Kitchen Countertops -- Don’t Replace, Refinish! You’ll save your clients up to 50% over replacement costs with Miracle Method’s Natural Accents stone look. Your clients will thank you and your buyers will love the look. A refinished countertop is durable and can extend the useful life for 5-10 years with basic care and maintenance. They’re beautiful, durable and affordable. You can rely on Miracle Method to make tired bath & kitchen surfaces sparkle. Call 1-888-271-7690 or Find A Location for your free estimate! Is Miracle Method’s work guaranteed? Miracle Method offers a five-year transferable guarantee against peeling or failure of adhesion for counters, tile and bathtubs. You, your client and your buyer are protected! Our Photo Gallery will give you a number of examples of how Miracle Method has turned tired into inspired!